The Penny Pinchers Exchange is a consignment shop in Marion, Massachusetts that raises money for the First Congregational Church in Marion. In 1885 Elizabeth Taber gave the church the Chapel Building located just up the street from the church. 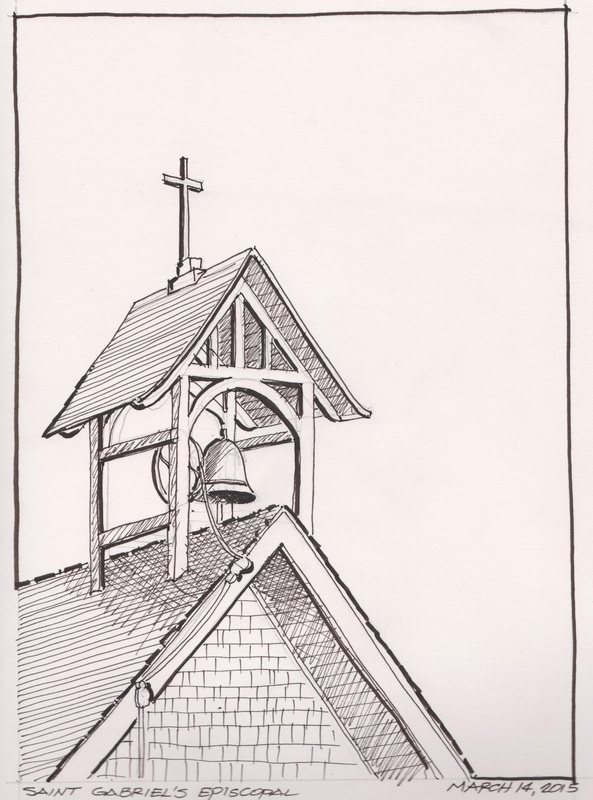 The building was used for Sunday School and Prayer Meetings prior to it’s current use.Faber-Castell Pitt artist pens in an 8″ x 10″ Alpha Series Stillman and Birn Sketchbook. This is a watercolor from a photograph that I snapped over the weekend. Skeeter was a small sailboat undercover in a boatyard in Marion, MA. 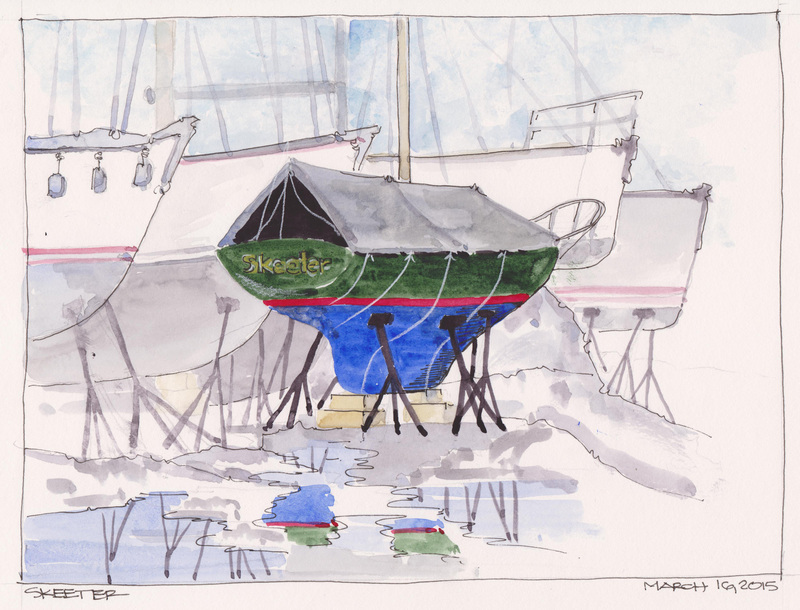 The colors of Skeeter were a stark contrast to the larger, more monochromatic boats in the background. Watercolor with a pencil sketch under. Once again, I need to learn when to stop in the process. In this case I added the extra ink work that was not needed. Daniel Smith Watercolors, White Charcoal Pencil in an Alpha Series Stillman and Birn Sketchbook. Great Birthday Dinner for my wife Lisa and her Dad John. Both March babies. We enjoyed a fantastic Greek Dinner at Estia Taverna in Mashpee Commons, MA. 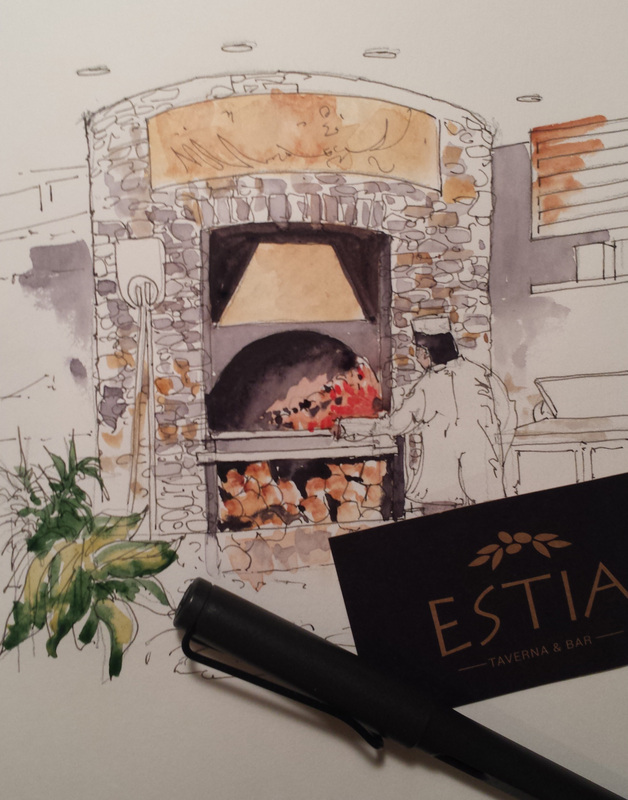 A quick sketch of the coal fired oven at the restaurant. Lamy Fountain Pen with Noodlers Ink and Daniel Smith Watercolors in an Alpha Series Stillman and Birn Sketchbook. 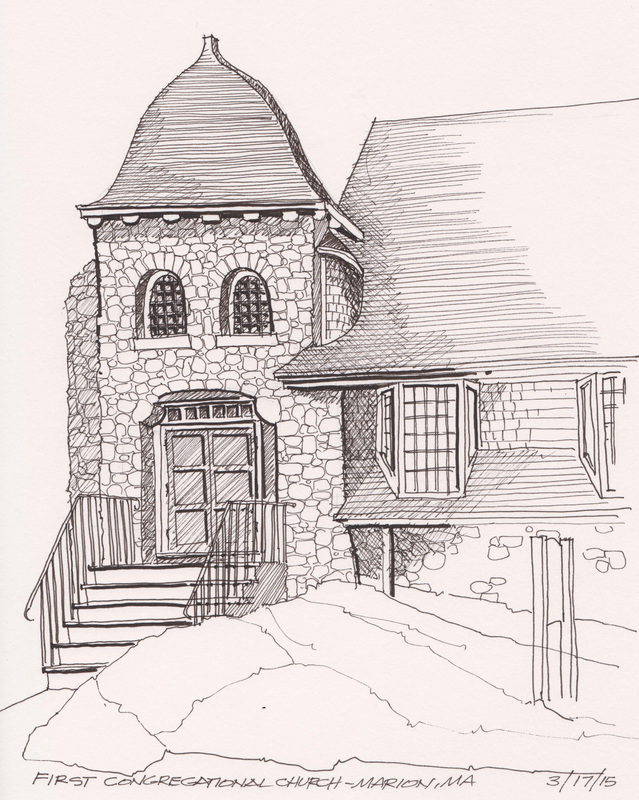 Pen and Ink sketch of Saint Gabriel’s Episcopal Church in Marion. MA. The current Chapel was consecrated in 1900. The patron saints name is said to have originated in a storm at sea, when Admiral Harwood called upon the Angel Gabriel for deliverance. He promised to build a church in Marion, which subsequently became St. Gabriel’s. Pigma Micron Black Pens in a Stillman and Birn Alpha Series Sketchbook. I love graphic signage and old signs. This is a sign that I have always liked near the office. Last time I drove by I believe it was Arnie’s Pizza, oh well. It is still a great graphic sign. 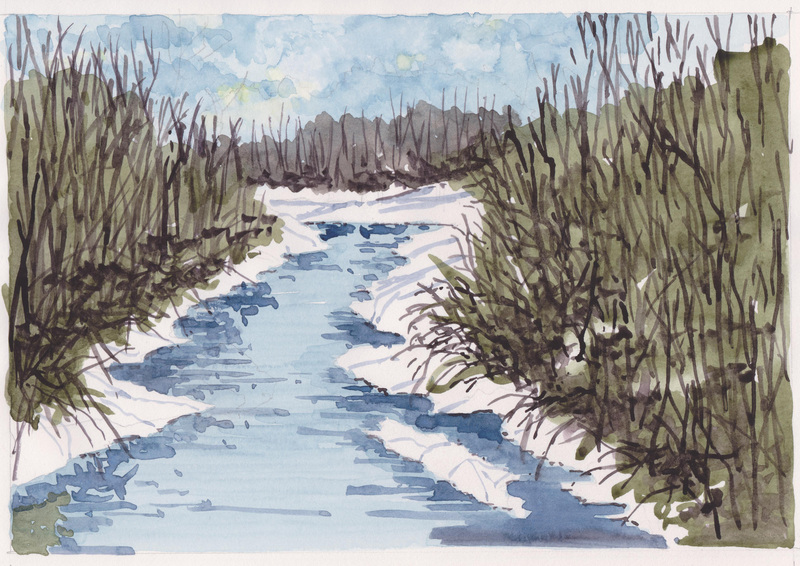 Daniel Smith Watercolors in an Alphas Series Stillman and Birn Sketchbook. For todays sketch I painted a Birthday Card for my wife Lisa. 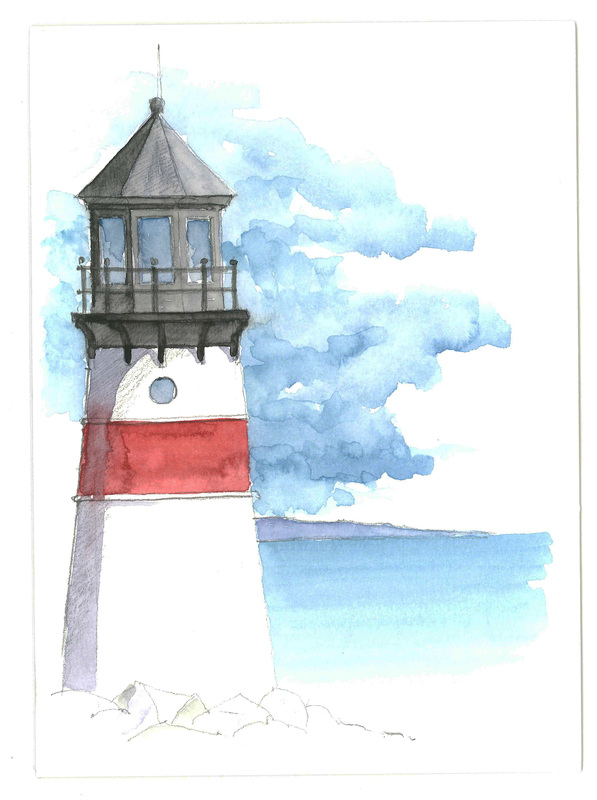 The watercolor is of a fictional Lighthouse based loosely on the many lighthouses that we have seen in New England. Pelikan Watercolors on a Strathmore watercolor card. Happy Birthday Lisa! As spring approaches, there is beginning to feel like there is some life coming back to New England. This is a view of the Three Mile River in Middleboro, MA. The river slices through very thick brush on both sides and reflects into river. This is the type of sketch that is the whole point of A Sketchbook Odyssey. To challenge myself and go outside my comfort zone of sketching architecture and the built environment. 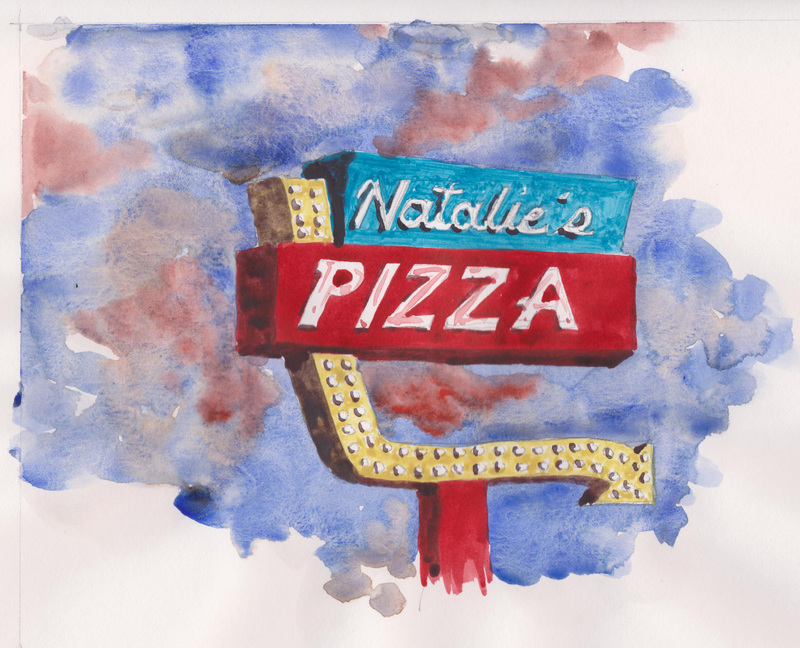 Daniel Smith Watercolors in a Stillman and Birn Alpha Series Sketchbook.